Day 2 of Pool Play wrapped up at the 2017 Shieh Tournament with the Academy Cougars and ND Royals each going unbeaten for the top two spots in the league. The Cougars had an early start to the day, narrowly getting by the Tiyan Titans 30-27 while beating the Harvest Eagles 30-14. Academy rounded out their pool with a win over the Sanchez Sharks to secure a top seed. In their last game, the Cougars started off in the lead, 12-3 after just over 10 minutes of playing against Sanchez. Right side hitter Shannen Munoz camesout strong as one of Academy’s most active players, registering five kills in the set. The Sharks turned around double-digit deficit after scoring off four aces in a row to get within 23-16. Cougar Outside hitter Lauren Hoebing checked in with a fast block to reset her teams momentum, ending the Sanchez short rally. The Academy Cougars found their rhythm once more as Munoz made a strong kill down the left side of the Shark defense. Leading her team to the win, Munoz helped orchestrate the final four points needed for the Cougars to go unbeaten in Pool B. Just 8 minutes into the game the Harvest Eagles are started off strong up 14-8. 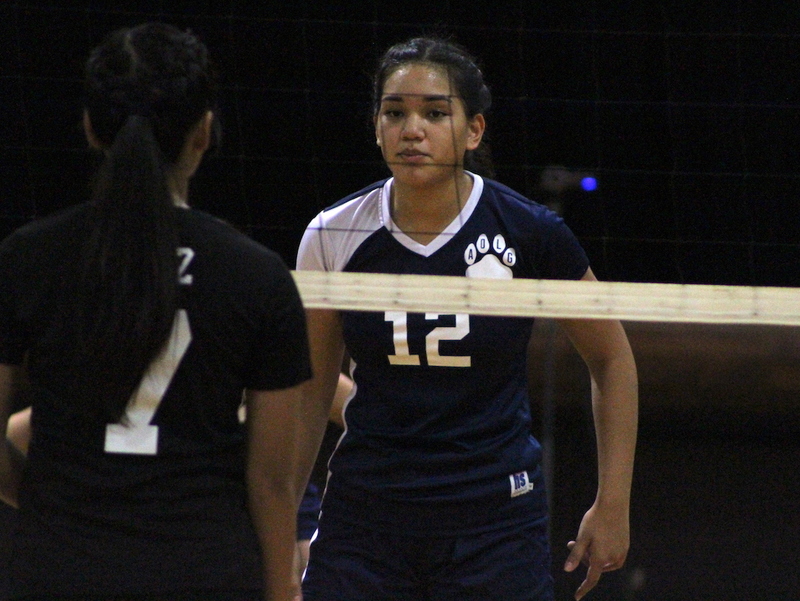 Tasi Castro, from Harvest came away with a strong block helping her team gain ground. The Eagles took advantage of poor passing from the Titans to lead late in the set 20-16. After an ace from Eagle Natalie Branch, Tiyan started to work on a strong comeback. Tiyan came away with two blocks on the Eagles followed by two aces to bring the score close once more, 23-22. Harvest played determined to grab their first win of the tourney, extending their lead 28-23. Within just one point from earning a win, the Eagles made two errors to keep Tiyan alive 29-26. Tiyan went on to tie the match at 29, but the Eagles scored the last point off an error to end their night.